The Pythagorean Theorem, a2 + b2 = c2, is probably the most famous and well-known formula in all of mathematics. Pythagoras is credited with discovering the relationship between the sides of a right triangle, but the truth is highly debated. Regardless, the theorem is used frequently used, so it is very important that you know it! First of all, the pythagorean theorem can only be used in right triangles. In all triangles there are three sides; in a right triangle, two of those sides are known as the legs and the other side is known as the hypotenuse. Notice the arrows above pointing across from the right angle to the hyptoenuse. The hypotenuse is important because it is the c value. To use this theorem, subsitute the two values that you know, and solve for the missing one. Make sure you place the hypotenuse in the right location! Take a look at the examples below. 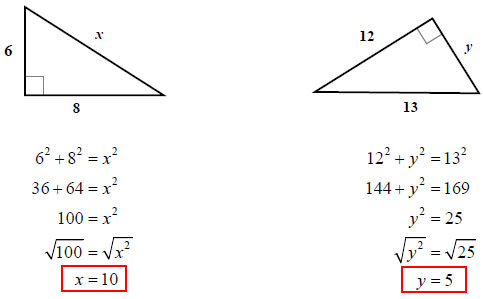 Again, notice how the hypotenuse is always substituted in for c (the right side of the equation). It's as easy as that! Congratulations, you now know how to use the pythagorean theorem. Return to more free geometry help o r visit the GradeA homepage for other free math help resources.